my friend's studio(poolsidesign.com)will be releasing their new DVD on this thursday! I made my very first animation for their last one, "undo"
if you're interested in animation, please cooome!! 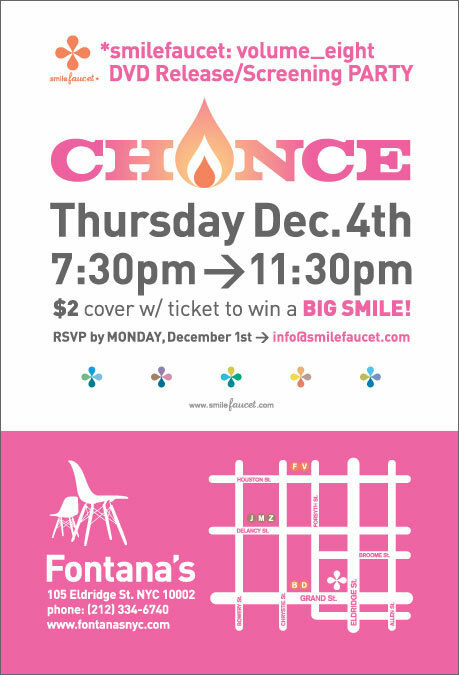 After a few months screening submissions, late nights illustrating and animating, and a crazy day involving serious musical chairs, *smilefaucet is pleased to announce the world premiere of its ninth installment in its series - CHANCE! Featuring an open by EATDRINK, this should be a fun night to view work by some great talent, old and new! We’d love for you to come out and celebrate this occasion with us! RSVP by Monday, December 1st.